Whether you're after a random encounter that's more than just a standup fight on featureless terrain, an exciting mini-adventure on the spur of the moment, something to break up the party's travels, or a starting scene for an adventure of your own devising, this book has something for you. To help speed up play, every encounter is designed to fit one or two pages containing all of its pertinent information, so there's no need to flip between pages. Lavishly illustrated with maps, everything you need to play these encounters is within the covers of this fantastic book. 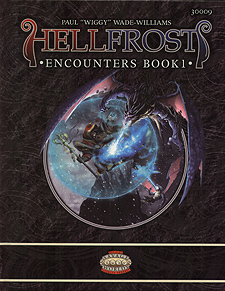 Although designed for the Hellfrost setting, each encounter contains the stats required for play, so it can be used in any Savage Worlds fantasy setting.